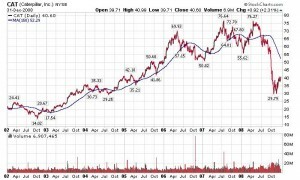 The chart of Caterpillar (CAT) stock from 2002 to 2008 is an example of a cyclical stock that people became enthusiastic about and then subsequently sold in a panic. Notice how the stock steadily rose from the end of 2002 to the beginning of 2008 and then gave up a substantial portion of those gains in less than a few months. People generally feel twice as much sadness or pain when something is lost than when something of equal value is gained. Humans have evolved to be this way, because when the world was more resource constrained, our ancestors’ survival depended much more on keeping what they had than getting something new. The emotions that arise from loss are from parts of the brain that evolved much earlier than the parts responsible for rational thought. This is the main reason why stocks go down faster than they go up. People tend to get depressed and want to capitulate much faster than the time it takes for them to get euphoric. Furthermore, as a stock rises, many people quickly sell to lock-in their gains. The shareholder base gradually transitions from distressed and value investors, who contest momentum, to growth investors, who typically invest hoping to ride a trend. When a stock goes down and its momentum shifts, the only people that would be interested are the distressed or value investors. Since these types of investors tend to be less impulsive and generally more risk averse, they are usually slow to accumulate shares. After all, they know that betting against a current trend often results in initial losses. Distressed or value investors are in no rush to build fully-sized positions. This entry was posted in Uncategorized by Ravee Mehta. Bookmark the permalink. Former hedge fund analyst and author of The Emotionally Intelligent Investor: How Self-Awareness, Empathy and Intuition Drive Performance. Prior employers include Soros, Karsch Capital and DLJ. Ravee is also a contributor to Seeking Alpha. Interesting …”People tend to get depressed and want to capitulate much faster than the time it takes for them to get euphoric.” Could it be the initial fall is instead panic, panic begets panic…in the end comes defeat and sadness? I say this because volume at the peaks indicates excitement that gives way to fear. There is often heavy volume early in a trend as growth rush to jump on the bus…as the bus goes its way, people get comfortable riding along until the next stop approaches. At the next stop depending on the size of overhead supply a battle ensues, and this goes on until the battle reaches a peak somewhere along the trend when confidence turns to panic. So when do we feel sad, during the excitement of the fray or ironically at the end when we are defeated? people feel depressed at the end. Depression causes people to want to sell what they have and buy something else. Its the same reason why some people resort to retail therapy when they are depressed. The initial drop often brings about denial instead of depression. People do not want to admit that they were wrong so they are biased to hold on to losing positions too long and hope to get back to break even. Interesting and well said. Fear and greed are the drivers of us all, and certainly the drivers of the markets. If we could make our decisions without emotion, based on facts and rules and a written trading plan we would be far ahead. The market would not be the market if this was the case. Instead, the market’s character is that emotion plays an equally important role as fundamentals. It just matters at what stage of the market are emotions more relevant. I have an old childhood friend now engineer, who in the summer of 2011 insisted that gold would go to 2500 according to his calculations. Remember he is an engineer, seemingly confident that calculations in the market like those in physics class where calculating a point in time is a simple feat. My warning that the chart showed the stock was demonstrating exhaustion and excitement (gold had broken out of its weekly trading channel in strong candles) seemed to have fallen on deaf ears. Fortunately, or unfortunately depending on how you look at it, market physics includes human variables of greed and fear versus participants who only made decisions based on “facts and rules”. Based on your explanation of how people are much more sensitive to loss that realized or expected gains, I take it you read “Thinking, Fast and Slow”? In case you haven’t, I’m sure you would love it. I am a novice investor and have purchased shares of FB and Apple, and I came across you through some reading I was doing on Seeking Alpha. Your articles on both have been enlightening. Eddie, thanks for your comment and for buying my book! I did read the Kahneman book and while I agree with him on most topics and reference him in my own book, I actually disagree with him on intuition with respect to investing (see my blog post on this). Please note that while I still own FB, I no longer own AAPL. As I write in the book, I stay away from growth stocks where momentum has broken. I think this is the case with AAPL since the company has missed expectations 2 quarters in a row. I may get back involved with AAPL if I can get confidence the company could go back to consistently beating expectations.